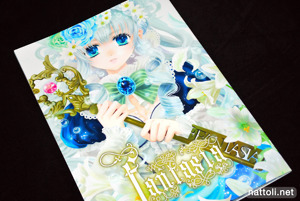 Fantasia is my first purchase from the artist Sakura Yutsuki, and to be honest, the art style is generally not one I go looking for. So while this was more of a purchase to just pad my order, I actually ended up quite liking all the elaborate use of detail, lace and flowers in every illustration. 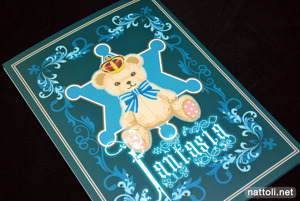 Fantasia is an A4-sized doujinshi, and it comes inside a matching folder that also holds a little 'Thank You' business card from Sakura Yutsuki and an order form with her other releases. The book itself is staple-bound and 28-pages when including the covers. The level of detail in the illustrations is reminiscient of Nao Tsukiji's works, although the character illustration style is not at all similar. Sakura Yutsuki's girls have doll-like round faces and eyes that look perfectly suited for shoujo manga. She also has another, more womanly-look for her characters, though it only appears on one character in Fantasia. 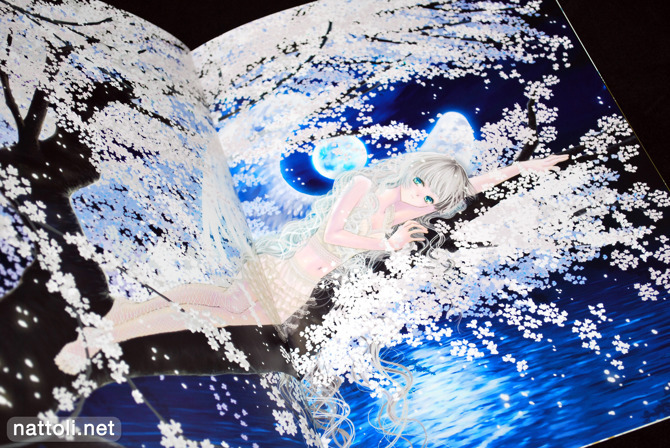 The cover illustration is repeated inside the book, though without text on a blue background. Sometimes it seems there's almost too much going on in her illustrations, like in the one above with the wedding dress strewn with pearls and lace, roses flying about and floating islands in the background XD It's still beautiful, but it can feel like overkill. Though I'm not familiar with all her illustrations, it does appear that the art works are organized with older works in the back, and newer ones in the front. While the first 20-pages or so feature digital works, the last few pages look like real media illustrations, with markers and pencils. 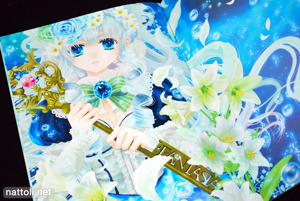 Even though they're probably older, they're still up to par with the rest of Sakura Yatsuki's works, though naturally it would be a lot harder to re-create lacy patterns with markers ^^; All in all, I'm really glad I bought Fantasia, as Sakura Yutsuki is definitely an artist I'll be keeping an eye on in the future!